Stuffed Peppers with couscous and black beans is a tasty and healthier vegetarian take on this Southwestern favorite. Liver-loving inclusions, such as tumeric powder, make this dish dazzle! Boil 1 cup of water in a small pot for the cous cous. Once the water boils, remove from heat and add the cous cous. Stir the mixture and cover for 5 minutes. After 5 minutes, stir the cous cous again to fluff. In a medium skillet, heat the olive oil on a low to medium temperature. Add the onion and garlic to saute for approximately 6 minutes, or until the onion is slightly translucent. Stir in the black beans, corn, tumeric, paprika, and cumin and cook for another 3-5 minutes. Add the black bean mixture and olives to the cous cous and stir. Pour a very thin layer of water on the bottom of baking dish. 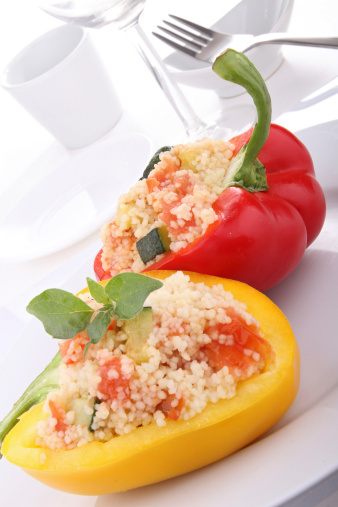 Spoon cous cous and black bean mixture into the bell pepper halves and place them into the baking dish.